Cone Engineering, the company whose exhaust components can be found not only on almost every Analog build, but on countless other builds around the world, has completed a set of slip-on mufflers for 2002-2016 Air-Cooled Triumph models. The 2-2 Shorty Performer Mufflers will give your Triumph project a bit of bite, without making the bike excessively loud. The finish of the components is designed to match the OEM mufflers on your bike: Bright Polished finish is available for Bonneville/T100 and Thruxton models. All necessary installation hardware included in kit, complete with kick stand stop for Thruxton models and center-stand stop for Bonneville models. 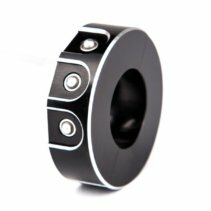 Available in black ceramic coated finish for $100 more, lead time takes an additional week for ceramic coated kits. Not compatible with mag-wheel Bonnevilles, please contact us with questions about fitment. Cone Engineering, the company whose exhaust components are found on almost every Analog build, completed this Triumph Bonneville T100 slip-on exhaust kit for for 2002-2016 Air-Cooled Triumph Bonneville models. The 2-2 Shorty Performer Mufflers give your Triumph project a bit of bite, without making the bike excessively loud. Cone Engineering components are used on projects all over the world. So, why not offer them to our customers, too? Designed and manufactured here in the U.S., so you can expect unmatched quality. The finish of the components matches the OEM mufflers on your bike: Bright Polished finish for Bonneville/T100 models. The kit ships with all necessary installation hardware, complete with kick stand stop for Thruxton models and center-stand stop for Bonneville models. Available in black ceramic coated finish for $100 more. The ceramic coating happens when ordered, and therefore lead time takes an additional week for these kits. Hit the link here to see how these sound on the new water-cooled Triumphs.